Lemons, preserved or not, are really great for many types of foods from Western to Eastern, stopping by at Middle eastern, so really universal. Lime is sweeter than lemon and is used more in Eastern dishes but you can interchange them as I discovered if you have one and not the other. I have been experimenting with lemons and limes recently so here are some of my discoveries and money saving tips. To keep lemons and limes fresh for a long time, do not put them in dishes and display them on dining tables as they show in home improvement shows. Instead, put them in a jar and fill it with water and keep in the fridge. This way, they keep for a long time instead of becoming dried and unusable. Lemons and limes are quite expensive, so this is a good money saving idea. Lemon rinds can be dried at home, before you use the juice for cooking, so try to buy unwaxed limes and lemons and make lemon peels instead of throwing the peels away. It is quite easy to make preserved lemons however, the cost and time required are not worth it, according to me. So it is cheaper to buy organic preserved lemons than making them at home. Plus you can buy these anytime of the year- if you choose to make them at home, lemons can be quite expensive in the summer, so you have to wait for winter to make them at home. However, one money saving tip I have discovered is not to throw the fleshy bits as many of the Moroccan recipes suggest and only using the rind. In fact, once you cut everything in bits and discard the inedible internal skins and bitter seeds, you can use everything up. I have so far used these in Moroccan style lamb and chicken; and Italian style pork. I have used grape juice to sweeten the dish as the lemon bits can be quite sour. Both lemons and limes can be used to make lemonades. I prefer a quick version using squeezed lime and lemon juice and some sugar and a pinch of salt- then mixed with fizzy water and ice. You can thrown in the used rinds and some mint leaves if you have them. A cheap cool drink for the summer. Categories: creativity, fruit, homemade, natural, organic, recipe, reuse, saving money, seasonal, vegetables, waste, zero waste | Tags: experiment, food, Lemons, Limes, Moroccan, Preserved lemon recipes | Permalink. It is autumn and pumpkins are readily available. Use them for your Halloween pumpkin and then make pumpkin soup from that. But don’t throw the seeds or the gooey stuff around the seeds. That gooey stuff attached to the seeds can be taken out easily using water as this Youtube video shows. The gooey stuff can be thrown into your compost and the water used for the plants (so don’t use running water to clean the seeds as the video shows but use a bowl of water instead) The cleaned seeds can be used for snacks. Many of the recipes use shelled seeds and some don’t- you can use what you prefer. Due to some health issues, I can’t have the shells so I have used bought pumpkin seeds for this recipe but you can do the same with your seeds with shells. I have also let go of the olive oil used in many recipes because it is not good in the heat but used coconut oil instead. You need much less oil this way. Heat the oven to 180 degrees centigrade. Put your oven tray in for a few minutes to warm it, get it out and then put a tiny (I used a teaspoon) of coconut oil. It will melt. Spread the oil around the tray evenly and then put in a teaspoon of cajun spice or you can use garam masala. Mix the oil and the spice and blend in the seeds so that you have a even one layer of seeds on the tray. I also sprinkled some Himalayan sea salts on the mixture- again a small amount. Stick the tray back in the oven for about 10 minutes or so until the seeds have turned crispy and become a lighter colour. The finished seeds should have golden light colour- see the difference in the photos above and below. Then they are done. They are so yummy, low fat, free (if you have the pumpkin) and so simple to make! Its great party food plus very healthy-with nutrients ranging from magnesium and manganese to copper, protein and zinc. They also contain plant compounds known as phytosterols and free-radical scavenging antioxidants. Because these are high-fibre seeds, they’re able to boost your fibre intake, helping you reach the ideal amount of 50 grams per 1,000 calories consumed and keep your bowels clear. You can also take them as snacks for work or to the park because pumpkin seeds are highly portable and require no refrigeration. Categories: Festive season, fruit, health, homemade, making, recipe, saving money, seasonal, seasons, seeds, vegetables, waste, watering plants, zero waste | Tags: eat with seasons, experiment, health, Home, nutrition, party, seeds | Permalink. Summer has sort of started in the UK and so I am starting on a container garden experiment. Rather tired of growing conventional stuff and losing them to slugs, insects and weather, I am going to be a bit daring. 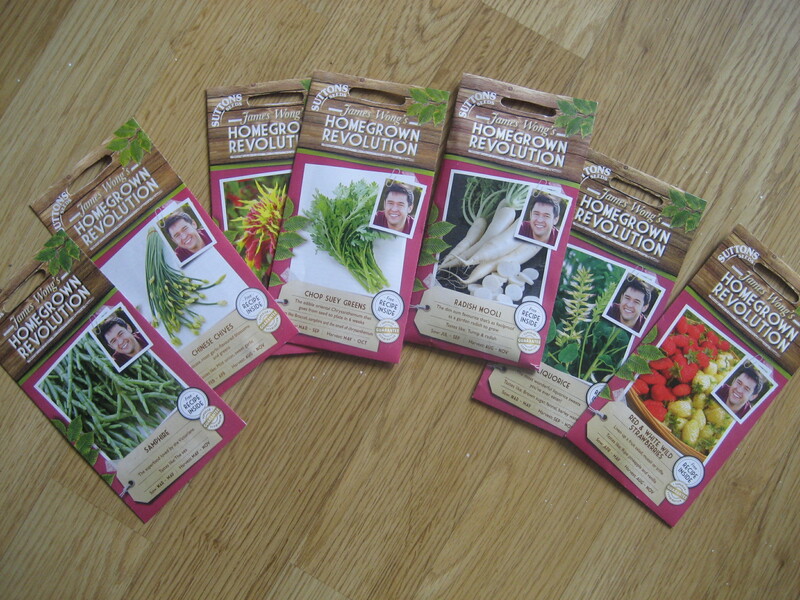 Three weeks ago, I bought some seeds as written about in the books by James Wong, the best selling author of many books including ‘Grow your own drugs’. James trained at Kew as an ‘ethno-botonist’ and has worked with herbalists and other experts to write his books. These include many unusual container vegetables- Chopsuey greens, Mooli, liquorice, Chinese chives, callaloo and Samphire. I chose these ones because I usually eat them and buy them at exorbitant prices from supermarket. For £2-49 each, it was worth a try! The Chinese chives have already started to come through- see below and note how I am protecting them from slugs by using crushed egg shells. 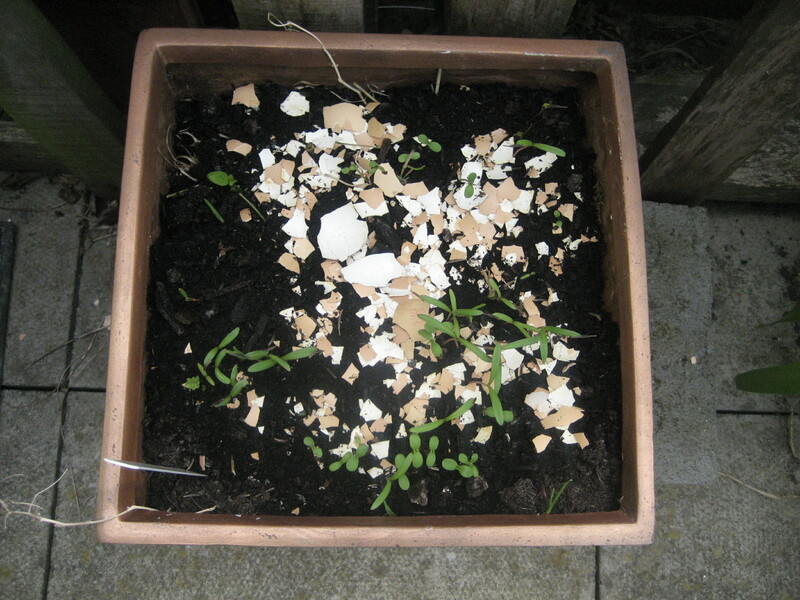 Unlike an ordinary garden, my terrace is protected from rats so I can use egg shells. 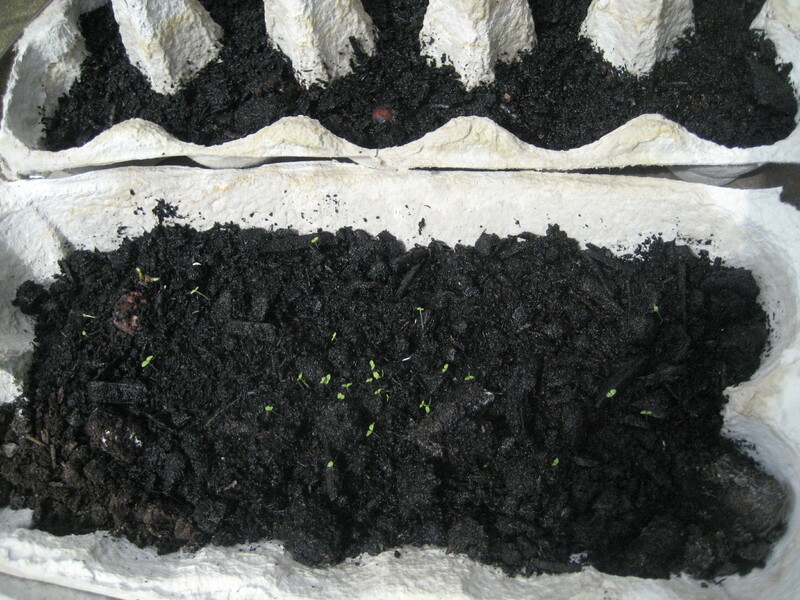 Above you can see the tiny liquorice and one samphire plant coming through in my improvised egg carton seed tray. James Wong also writes that Hosta is edible, but when I got round to seeing why my Hosta plants weren’t coming up, I realised that slugs had also found them equally tasty! However, I managed to salvage one tuber although at that point much its leaves had also been chomped through. 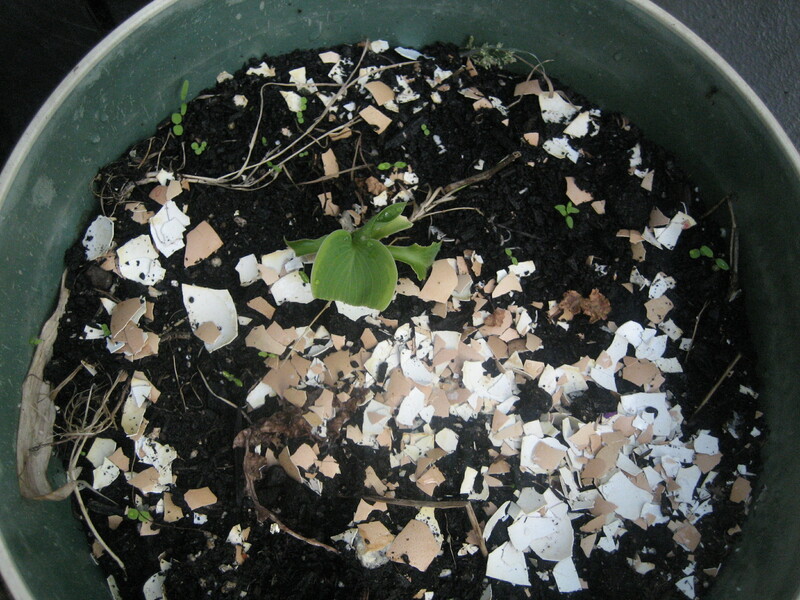 Re-potting them, and protecting the remaining leaves by using some crushed egg shells, has made new leaves come through. I can’t wait to try them in a stir fry. I will be posting stories of this experiment through the summer (including recipe successes and disasters!) and I hope this helps others who might be minded to try the same thing. Categories: balcony, container gardening, exotic plants, experiment, garden, health, herbs, outdoors, reuse, slugs | Tags: callaloo, chinese chives, container, egg shells, exotic vegetables, experiment, gardening, Hosta, insects, James Wong, Kew, liquorice, Mooli, samphire, slugs | Permalink.